Hmmm. I like the original 1978 design of the Cylon Centurions and, well, yes, I like the 2003 CGI design of the Cylon Centurions. But, erm, which is better? (Turns to camera and winks) There's only one way to find out! (Jumps up and down with millions of other Galactica fan boys and girls) FIIIIIIIGGGGGGHHHHHHT! And that's pretty much what you get for your money in the first half of Ron Moore's 90 odd minute finale to what most of us consider a genre changing series that deserves to be recognised as one of the great television dramas of the last five years. The finale itself is trying to be an obvious crowd-pleaser and, I think, laced with some self-satisfaction from the writing team too. And we still don't get all the questions answered. The odd thing, and forgive me here as I race right to the end of the episode, is the unnecessary coda set in present day Earth where we get that clunky 'ooh, don't mess with artificial technology' message with the montage of robots as the angelic forms of Baltar and Six stroll into Times Square. This show is not about the dangers of robots and artificial technology. It's about humanity, whether you're a toaster or a human, and about all their capacity for good or bad. We don't need hiting over the head with a warning about technology right at the end because the whole series is already full of it. Adama at Roslin's grave was the right ending; the coda in Times Square was Moore being masturbatory (he's in it for God's sake and it's too much of a breaking the fourth wall moment in itself). Yes, it can also be interpreted as a question over the "all of this has happened before and all of this will happen again" cycle, and that what happened to Kobol, the Colonies, and the original Earth might indeed happen yet again. But it still felt wrong to me. And let's not get started on the series' idea of God, just yet. Moore has been exceptionally lucky to have had such a great ensemble to work with. OK. The Opera House. 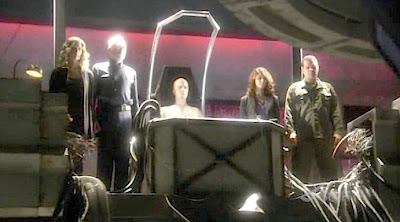 It was the Galactica all along and I thought the whole sequence with Roslin, Athena, Baltar and Six chasing after and eventually picking up Hera and entering CIC, intercut with all the visions of the Opera House, and then culminating with that shot of the Final Five on the balcony and on the upper level of the CIC was superbly done. A brilliant fusion of editing , music and performance and a very neat way to 'explain' the Opera House visions. This at the end of the mother of all battles. The first half of the story is exceptionally tense and gratuitously spectacular as the Galactica jumps into the jaws of The Colony and all hell breaks loose. 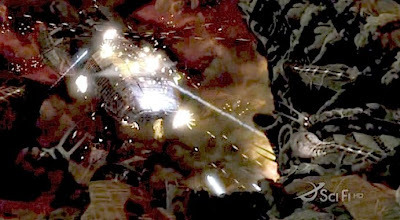 If you like your Galactica with guns, explosions, Cylon on Cylon fighting then this was for you and the visual effects team certainly surpassed themselves with the battle sequences. Intercut with the whole of the episode, and similiar to Daybreak Part 1, are more flashbacks to pre-Holocaust Caprica. Here we get to see that Bill's meeting is all about retiring and taking a new job, a discussion between Kara and Lee about the fear of death, Ellen and Saul desiring just to be together, Baltar's treason and Roslin's involvement in politics. Last week, these sequences felt misplaced but this week I think we can more clearly see the parallels with the long journey that each of the main characters undertook, particularly Roslin, and I felt this dovetailing was more successful this time round. Much of that success is really to do with the actors and the way they've taken this kind of material and given it heart and soul. Moore has been exceptionally lucky to have had such a great ensemble to work with. No wonder Tyrol decides to become a hermit in Scotland. What's less satisfying are the number of other closures here. Putting aside Baltar's epiphany in CIC about 'choices' and 'faith', I did feel that after his attempt at brokering a peace goes horribly wrong the writers found themselves in a corner with Cavil. He did unfortunately end up as the Black Hat and I found it somewhat inexplicable that the only way to cap his story was to have him put a gun down his throat. This felt a little too easy to me and it didn't satisfactorily complete his story, the show having abandoned his counter-philosophy about purity and evolution several episodes ago. Boomer's change of mind, her choice or exercise of free will, was rather heavily signposted anyway so it was no surprise that she'd grab Hera and make a run for it. I suppose there was some satisfaction in that Athena gunned her down in an act of pure revenge and it does fit emotionally in the show, especially as we get a flashback to Boomer's first meeting with Tigh and Adama and that whole scene about paying Bill back. Tyrol's strangulation of Tory when it is revealed that she bumped off Cally was, for me, just Moore gratuitously goofing off again even if it was payback time. The Final Five are all rather dysfunctional and that's underlined by the later scene on Earth when Tigh acknowledges he'd have done the same. But you did Saul, when you poisoned your wife, remember? No wonder Tyrol decides to become a hermit in Scotland. The idea of a 'clean slate' is a conceit that just doesn't quite work. It is also revealed that the visions of Six and Baltar, and the resurrection of Starbuck are all part of God's plan. They are all 'angels', guardians of the fate of humanity it seems. And that's as much explanation you get about Starbuck. She's just an instrument of God. Some will find issue with the fact that many of the events in the finale are simply explained as acts of God, and indeed some of the contrivancies here are explained away rather casually as 'God did it'. I don't mind this because it does fit in with the religious and spiritual themes of the series and the notion of God and Gods has been with the series ever since it started. Divine intervention is nothing new to the series but I felt that it was rather crudely used to paper over explanations for Starbuck and the visitations of the angelic Baltar and Six amongst other things. I also wasn't convinced about the casual way all 38,000 survivors decided it was best to cast off their creature comforts, their technology and ships and go native. Evidence of their origins would surely have been found 150,000 years later. Lord knows how they coped without their hairdressers and telephone sanitizers. And middle management must have been in an uproar without access to a jolly good hot bath. The idea of a 'clean slate' is a conceit that just doesn't quite work. Battlestar Galactica certainly refused to let its soul lag behind. Despite these problems, there is, in the last forty odd minutes, a neat structuring of each character's story beginning in the Caprica of the past and their ending in the present on Earth. It does justice to each of the people we've been close to for over four years even if it does feel like it will go on, akin to Return Of The King, for ever. 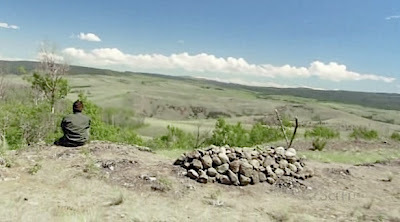 The acting from all the principals is what ultimately saves this and I'd single out James Callis as Baltar because the redemption of the character feels very true and Callis gets to the emotional core with such economy in the final scene where he and Six plan their farm and the reason for those flashbacks to his father become clear. And just look at the little scene in the first half with Roslin and Doc Cottle for emotional power and Mary McDonnell's playing of that is superb. Underpinning all of the episode is, quite frankly, some of the most extraordinary music for television you are ever likely to hear and composer Bear McCreary really deserves a plaudit for his amazing work here. The first hour is grand space opera on an epic scale whilst the last is a meditation on the capacity of the human soul, the need for faith and the cycle of life. 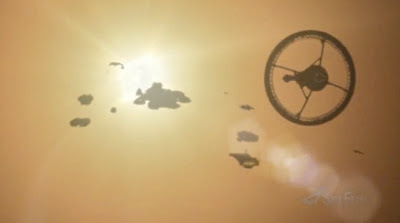 McCreary weaves his spell throughout it all, including nods to the original series Colonial March as Galactica and the fleet disappear into the sun. Whilst the finale is not entirely successful for some of the reasons I've gone into, it, and the series, is best summed up by Lee Adama's observation, "If there's one thing that we should have learned, it's that, you know, our brains have always outraced our hearts. Our science charges ahead. Our souls lag behind." It's not about the technicalities of the plotting in the end, the awkward way that this finale tries to wrap up the story, it's about the emotional content and the characters. Don't let the powerful emotional content, the religion, the politics and the mystical get dismissed amidst the fussing about the jigsaw puzzle plotting. Overall, it's a moving farewell to the series. Battlestar Galactica certainly refused to let its soul lag behind. So say we all. It's worth noting that Cavill's suicide was Dean Stockwell's idea. Apparently, he'd read the scene and said that Cavill's reaction to the situation didn't ring true, that the guy would know the jig was up, that there was nowhere else to go and nothing to be done. Suicide was the only way out, according to the actor. For me it didn't really work whether it was as written or as you say if Dean Stockwell thought of it. To be honest it felt like it was made up on the spur of the moment. It was just another thing to get out of the way so that Ron Moore could give us his mystical stuff and the 'Hitch Hiker' rip off in the last 40 minutes. Well, for your delectation, here's a link to Ron Moore interviewd about the end of BSG. And yes, the H2G2 rip off...I half expect Lee Adama to find Slartibartfast's signature on a glacier, but that's just my inner fanboi wanting unlikely crossover fic. The H2G2 refs were not a mere nod. It was more of violent shaking of the head with the tongue hanging out. The music however was a lovely reference and quite right too.